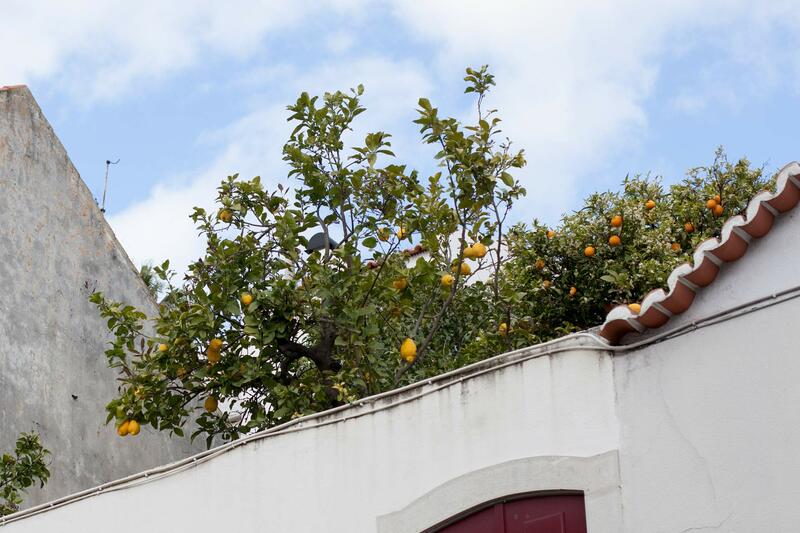 Seeing lemons and oranges on trees in Lisbon this Easter sparked my interest in citrus fruit. 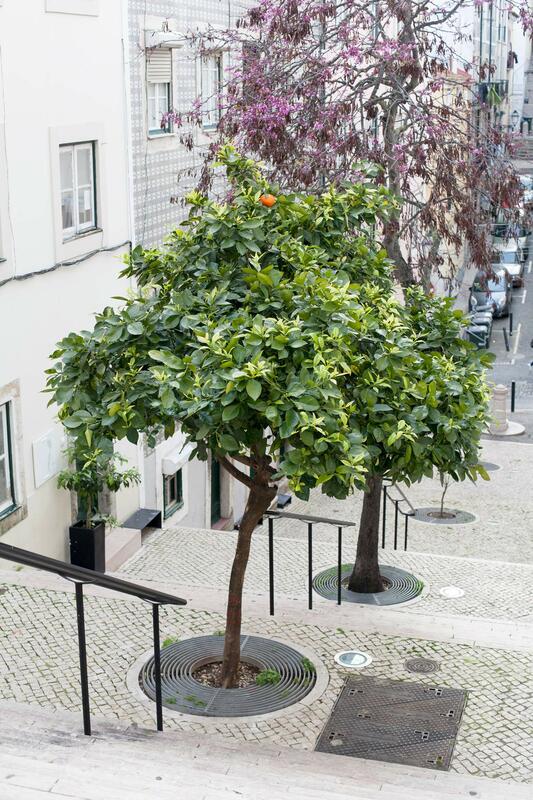 I carried out library research to learn about this fruit family of Asian origin while looking out for trees in the streets and gardens of the Portuguese capital. I didn’t expect to see any kind of fruit on Lisbon trees at the end of March. To me, who lives in a temperate climate of the Northern Hemisphere, spring is when apples blossom. As for fresh oranges and mandarins, with the peak eating season over, I would have thought they already were all harvested. What a surprise then to see lemons in a garden below our flat when we checked in for a week in the Portuguese capital on 27 March 2018! We would find more of them across the city in the days to come, as well as other varieties. I took pictures of the fruit in historical Lisbon, harvested some and tasted them. My investigation led me to extend my knowledge of citrus fruit far beyond that of the mere consumer I had been so far. In particular, the Portuguese National Museum of Natural History and Science and a travel bookshop enabled me to discover the history of their presence in Portugal, Europe and the rest of the world. Here is a chronological account of my journey of discovery. 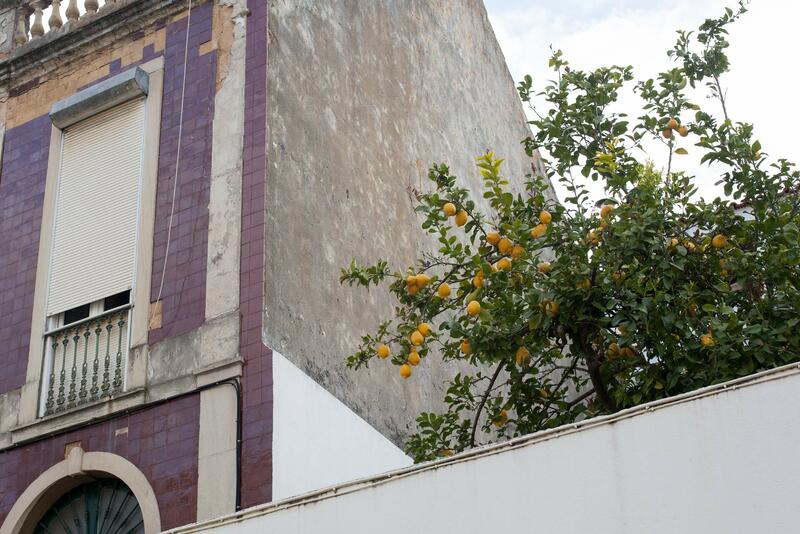 We came across our first citrus trees in the Bairro Alto district of central Lisbon1, where we arrived on Tuesday 27 March afternoon. 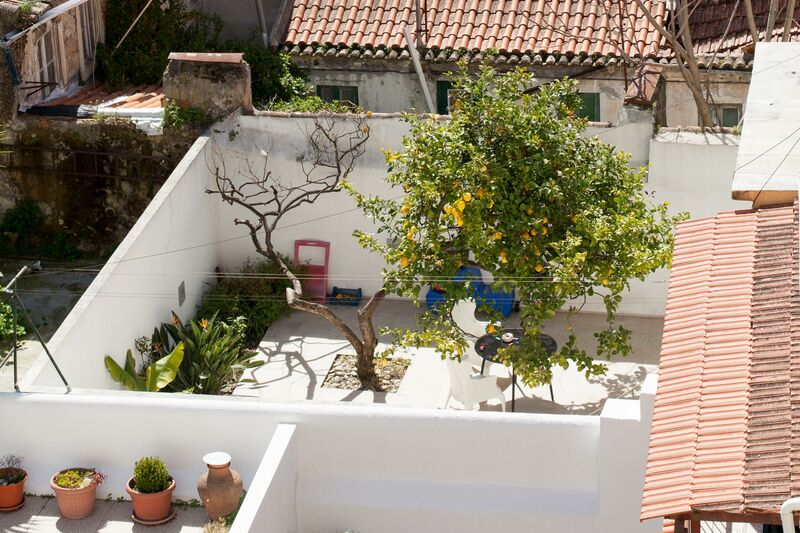 Rear gardens seen from our flat in Bairro Alto. Photo taken the next morning, 28 March, Lisbon, Portugal. Zooming in. Lemons! 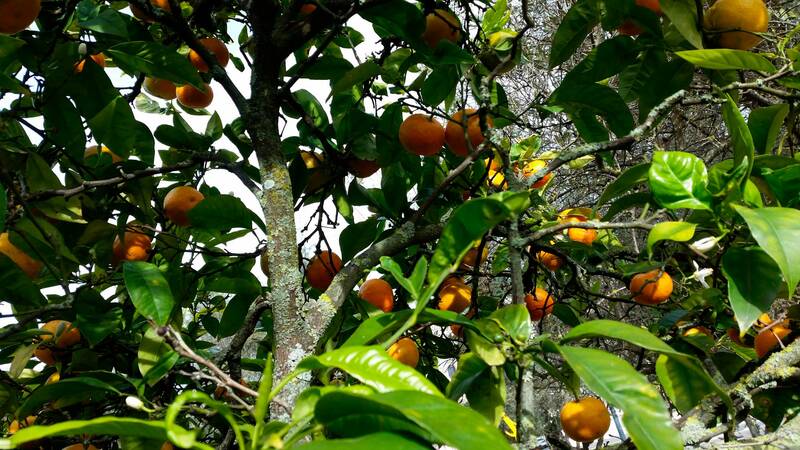 I had seen citrus trees in pots before, but it was my first time to see citrus fruit on a tree growing in open ground. Oranges now! 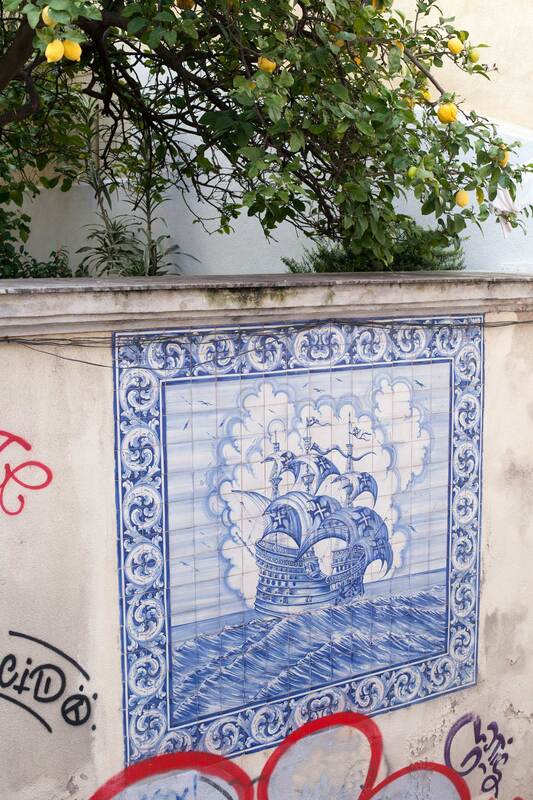 Seen during our late afternoon walk in the streets of Bairro Alto. Photo 27 March. 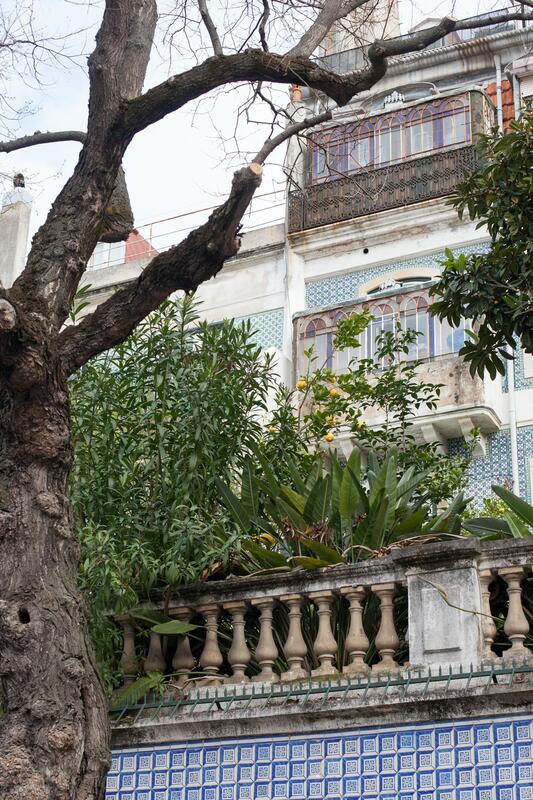 When preparing our trip to Lisbon, I searched for information about its fruit trees. I wasn’t very successful and thought we would see on site if there was anything interesting. Now I had seen lemons and oranges, I was determined to investigate further. I looked for potentially interesting places. I thought about the Portuguese National Museum of Natural History and Science. 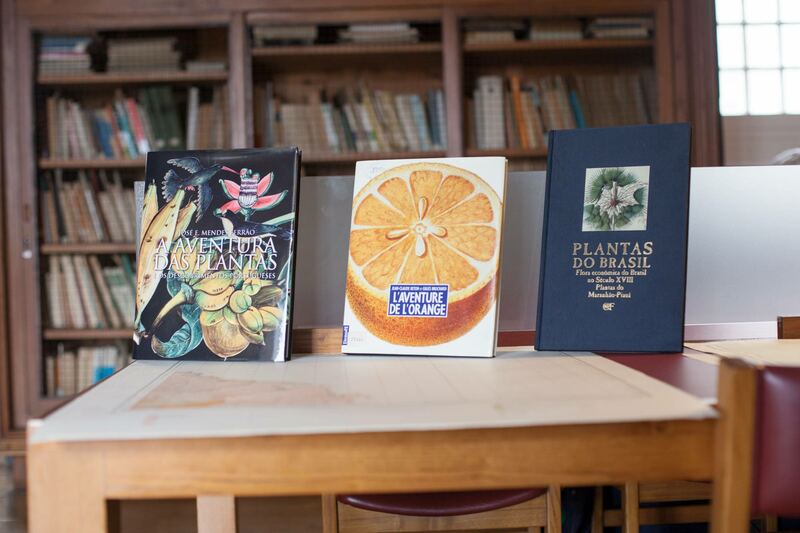 Indeed, I had found useful botanical and historical books at the library of the French National Museum of Natural History in Paris a month earlier. One of the branches of the Portuguese Museum was located next to the Botanical Garden just a few hundred meters far from our place. I would start from there! The Botanical Garden was unfortunately closed for refurbishment and the Museum library relocating. However, I was lucky to meet someone who would be of great help in the following days. 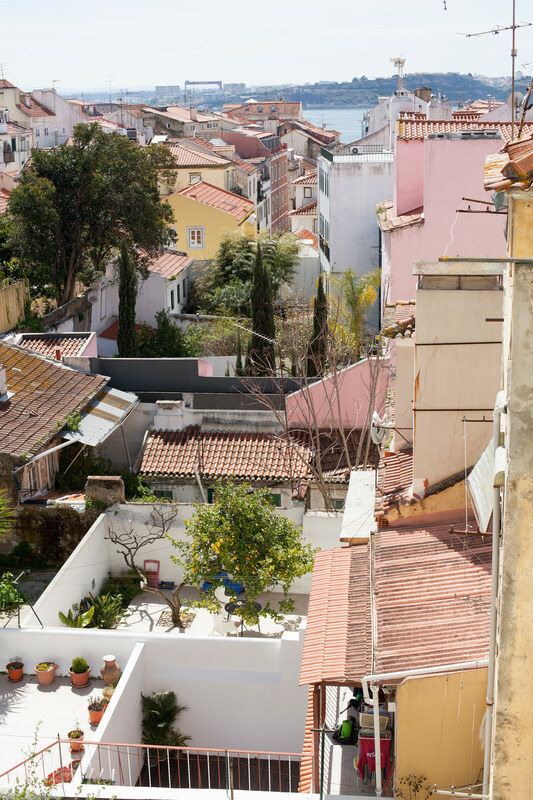 We exchanged email addresses and I left the Museum to visit the southern part of Bairro Alto. 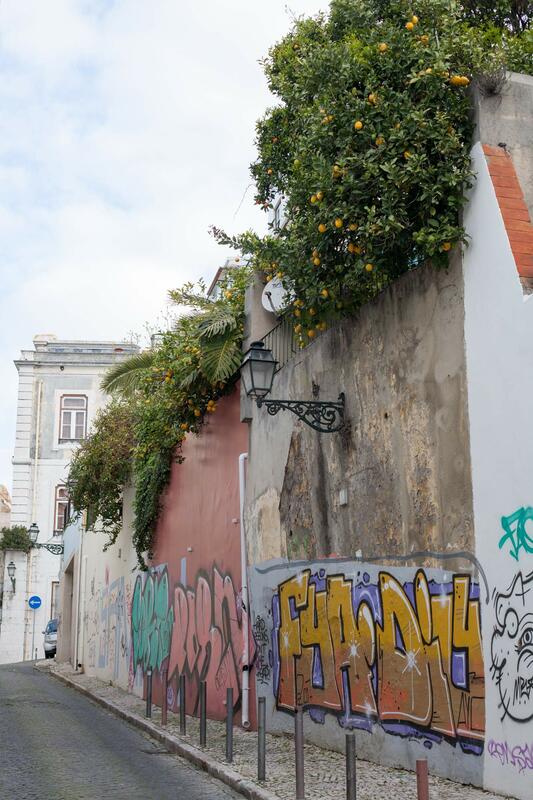 This is where I made my second discovery of the day, an alley of young orange trees planted in the very centre of the city, in the ‘Travessa da Laranjeira’, literally the ‘Orange Tree Lane’. ‘Travessa da Laranjeira’, Bairro Alto & Chiado district. Orange tree in the ‘Travessa da Laranjeira’ (‘Orange Tree Lane’). 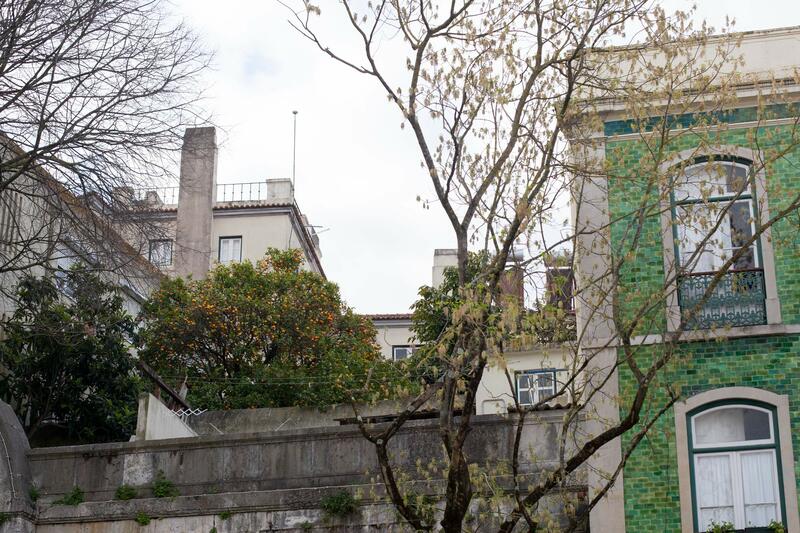 In the background: one of the many beautiful ceramic-tiled walls we saw in Lisbon. At lunch time, we bought our first freshly pressed juices: one glass of orange and one glass of a mix of lemon, apple and mint. We found them surprisingly mild and deliciously tasty. We also had the impression that they were very nourishing. 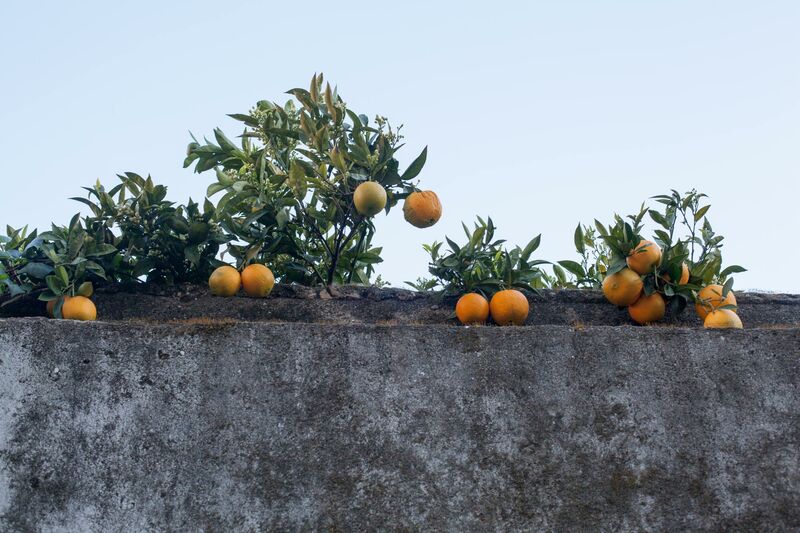 Were we influenced by the common view that local fruit is better than fruit that has travelled a lot, or by the idyllic palace of Monserrate we had just visited in Sintra? Or was it a reality? 30 March was a day of cultural discovery in Belém1. We unexpectedly also found something out about oranges. We visited a temporary design exhibition, called ‘Tanto Mar’ (‘So Much Sea’2) curated by the Portuguese Design Museum (MUDE), showcasing how Portugal and Brazil cultures and identities mutually influenced each other. Art and design creations of the twentieth and twenty-first century were used as case studies. ‘Tanto Mar’ (‘So Much Sea’) Exhibition poster, photo 16 April. In the exhibition, I came across a 1966 publication by a Portuguese graphic designer who was influential in both countries, Fernando Lemos. The booklet was open at a page where he had reproduced some of the work published in 1963 by Bruno Munari in his book ‘Good Design’. In this book, the Italian designer had chosen the orange as a metaphor for good design, describing it as ‘an almost perfect object where shape, function and use display total consistency’3. 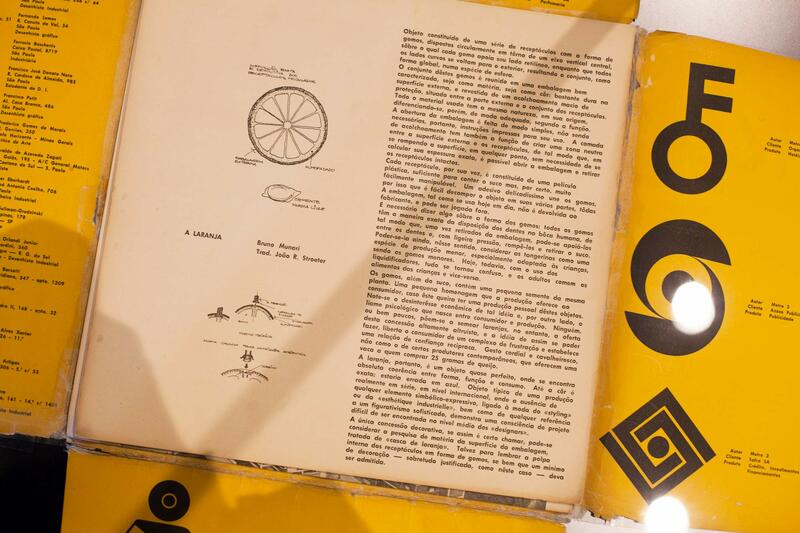 Bruno Munari’s description of the orange as a perfect object, translated in Portuguese in Fernando Lemos’ publication. Photo 30 March. Why did the exhibition curators open Lemos’ booklet at this very page? In the following days, I discovered several connections which could explain this choice. I learnt for instance about the explorations of Vasco de Gama who brought back sweet oranges from India and about the transatlantic move of the orange to the American continent and Brazil, which has since become the first producer of this fruit in the world4. After visiting this exhibition, I definitely felt that Portugal was a very good place to learn about citrus fruit! In the afternoon, we searched for books on citrus fruit. Our quest proved unsuccessful until we entered a travel bookshop on our way home. The shop keeper, who spoke French and English, recommended ‘The Land Where Lemons Grow’ by Helena Attlee5. She said it was about citrus fruit in Italy, not Portugal, but excellent. 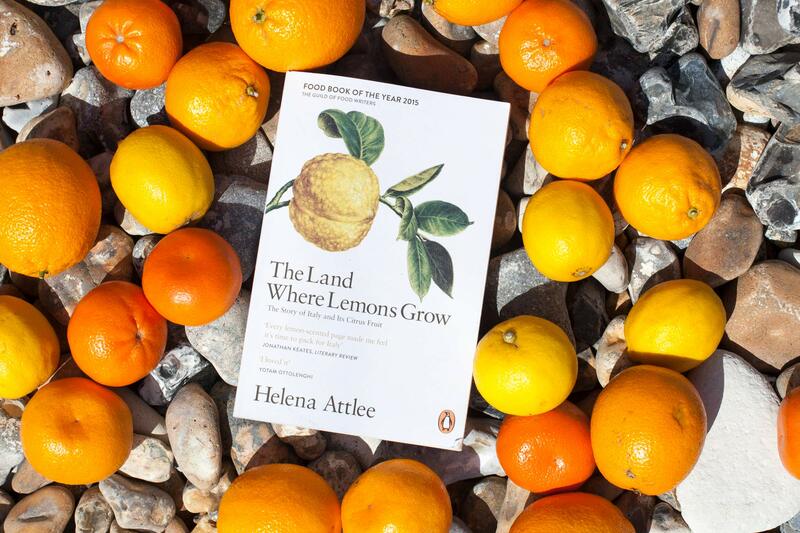 Helena Attlee’s best seller, and some of the varieties of citrus fruit that can be purchased in the British trade: oranges, lemons, mandarins, satsumas. Photo 26 April, United Kingdom. I read Helena Attlee’s book when back from Lisbon. It proved a great buy, enabling me to understand not only the story of citrus fruit in Italy, but also its global movements. It was the warmest day of the week. We could smell orange blossom scent very distinctly around the orange trees we found in Belém. 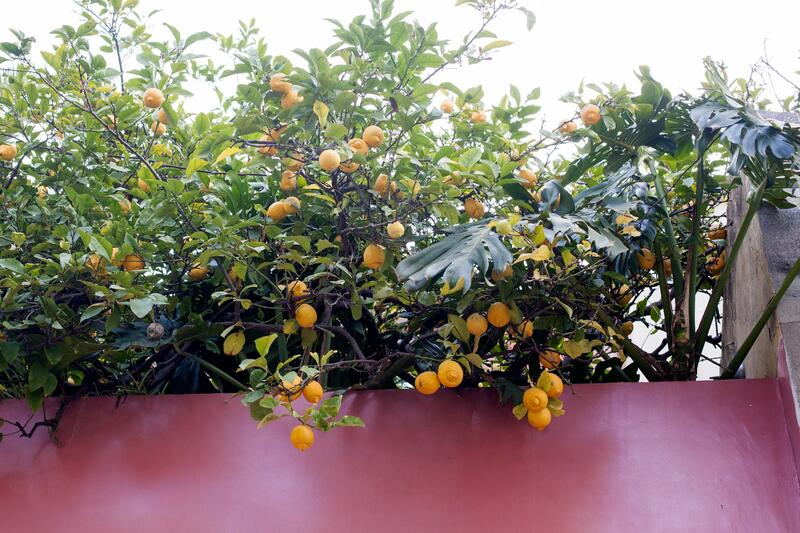 One of my most striking discoveries of the week was that orange trees could bear fruit and blossom at the same time. Fruit trees growing in temperate climates such as apple and pear don’t do that! Actually it took time for me to fully realise this and I didn’t take a proper picture of oranges next to orange blossom as a result. Hence the lower quality of the picture below, which has still the advantage of including a bee gathering on one of the flowers. 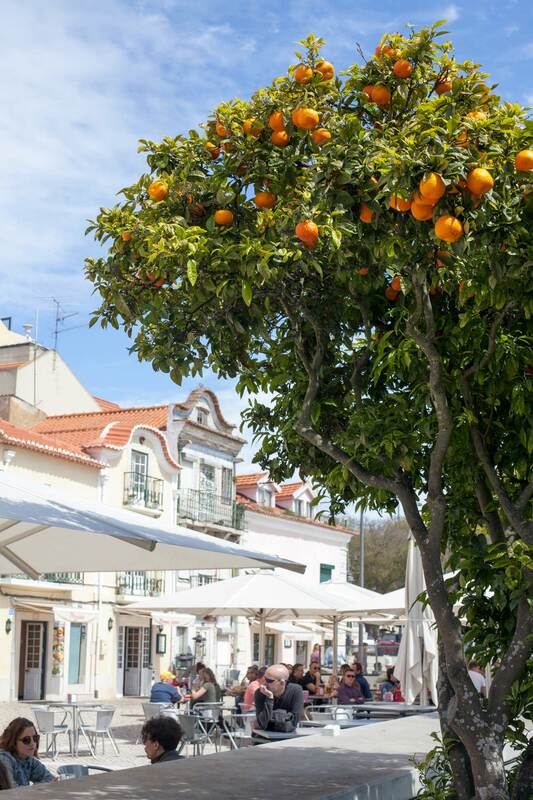 Orange tree blossoming and fruiting at the same time, Belém. It was a glorious day, with temperatures above 20°C. 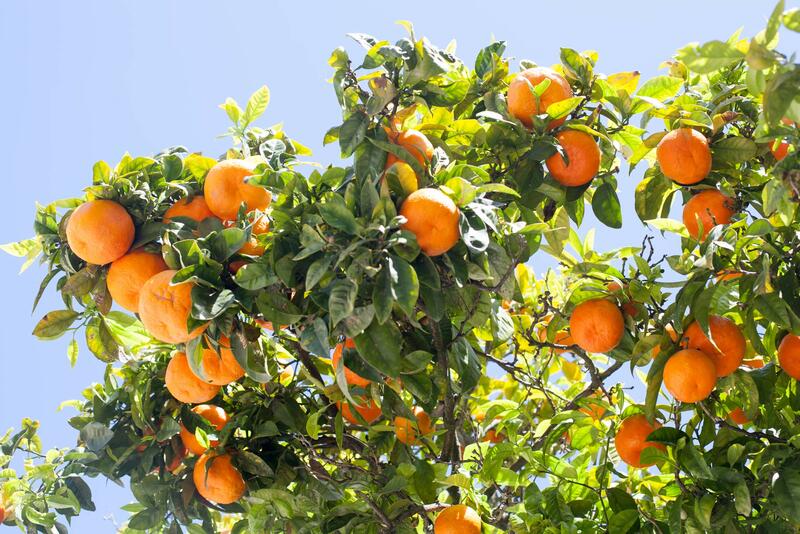 In the morning, we harvested our first fruit by climbing in a mandarin tree in a public park near the Jerónimos monastery6. Up in the mandarin tree. Photo J. Cattaneo. In the afternoon, in the same park, we came across an alley of orange trees planted next to cafes and restaurants. Belém, Sunday 1 April afternoon. Some of the trees were bearing a lot of fruit. We found windfalls, which we added to our morning harvest. We found windfalls of various varieties. The big orange was around 10cm in diameter. My plan was to taste the fruit, which I did on 3 April. Easter Monday was the most intellectually rewarding day of the week. I was welcomed by Mrs. Branca Mories, in charge of the Museum of Natural History and Science’s library and archives. 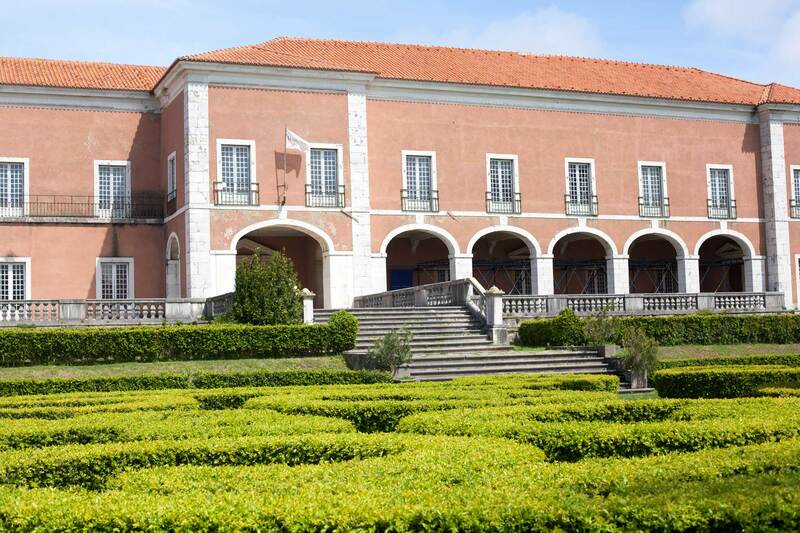 We met at 10am in the Palácio da Calheta, located in the Tropical Garden of Belém. I would stay there most of the day to carry out library research. Palácio dos Condes da Calheta, Tropical Garden, Belém. The palace wasn’t new to me. We had visited the ‘Tanto Mar’ exhibition there on 30 March. As for Branca Mories, she was the person I had met on 28 March in the Bairro Alto branch of the Museum. After our 28 March conversation, we had exchanged emails and upon my arrival at the library, she showed me a pile of books she had selected for me. We talked about them in French and in English, as she was mastering the two languages. My Portuguese language skills would only enable me to do some reading. Three of the books the librarian and archivist selected for me. Jacaranda (which is not a variety of citrus fruit). 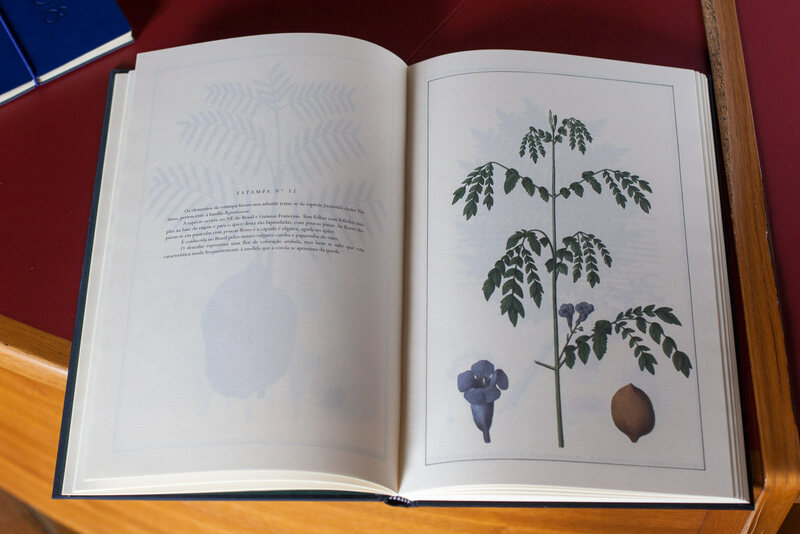 ‘A Aventura Das Plantas’8, literally ‘The Adventure of Plants’, written in Portuguese with helpful abstracts in English, was a beautiful book showing how plants used in agriculture moved from continent to continent over the centuries with the help of the Portuguese and other nations of explorers. The chapter on citrus fruit was of most interest to me. However, I also read about other fruit and plants, as this book contained fascinating insights about human discoveries and their effects on the journey of fruit varieties on the planet. 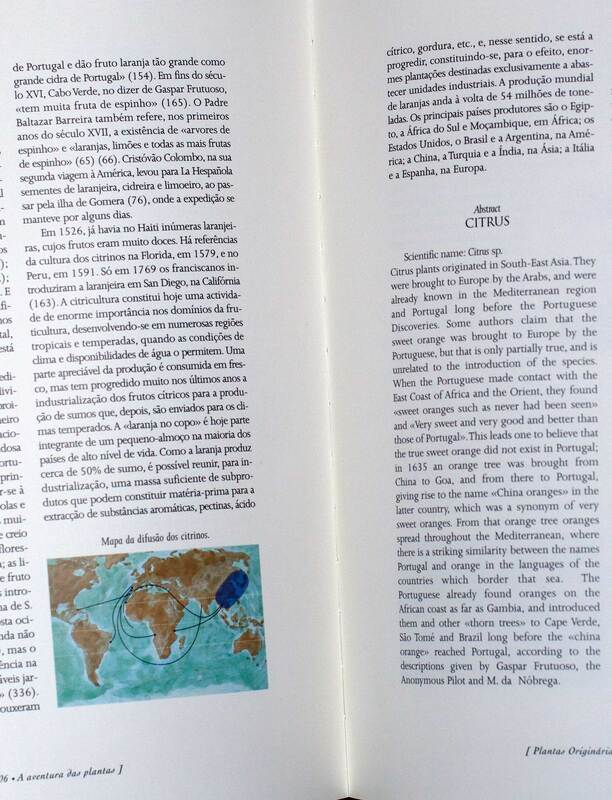 Abstract in English summarising the journey of citrus fruit across continents throughout history (A Aventura das Plantas8, p 206 and 207). ‘L’Aventure de l’Orange’9, ‘The Adventure of the Orange’, written in French in the 1990s, completed the picture. It showed to what extent citrus fruit, which originated in the tropical and sub-tropical areas of South East Asia, between latitudes N 15° and 25°, was now commercially cultivated in open ground between the 40° North and 40° South parallels (L’Aventure de l’Orange9, p 42-43), making it the most adaptable of fruit categories in human history. 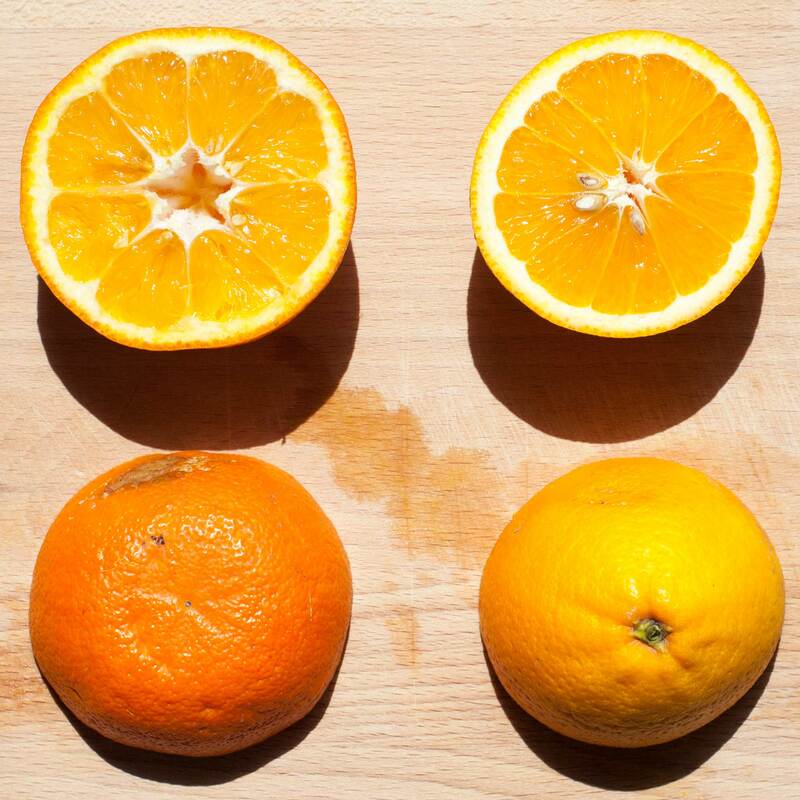 Stars: areas from which citrus fruit originated. 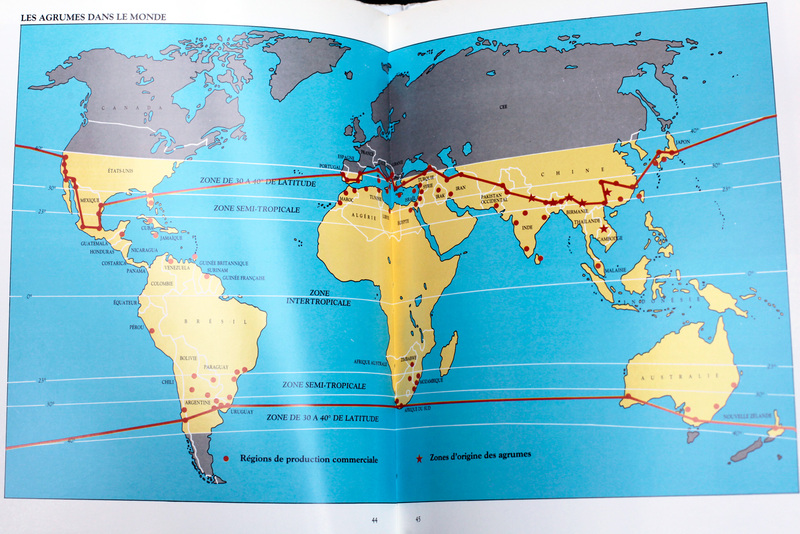 Dots: areas where citrus fruit was commercially cultivated in the 1990s (L’Aventure de l’Orange9, p 44-45). The archivist and I had other conversations in the afternoon, and I left with contact names and addresses I could use to investigate further. I expressed my wish to buy a copy of ‘A Aventura das Plantas’, which is now in my library, along with ‘L’Aventure de l’Orange’ which I purchased on the Internet upon my return. With these two books and ‘The Land where Lemons Grow’, I would be equipped to learn a lot about citrus fruit. 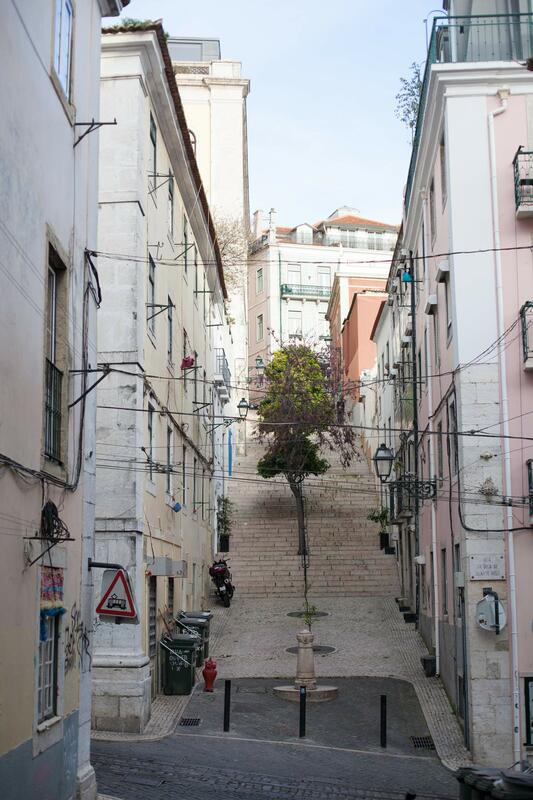 On this last day in Lisbon, I tasted the fruit we picked on Easter Sunday in Belém. The windfalls picked in the afternoon were different from each other. The two to the right in the picture below were dry and inedible. The two to the left were fleshy and juicy. 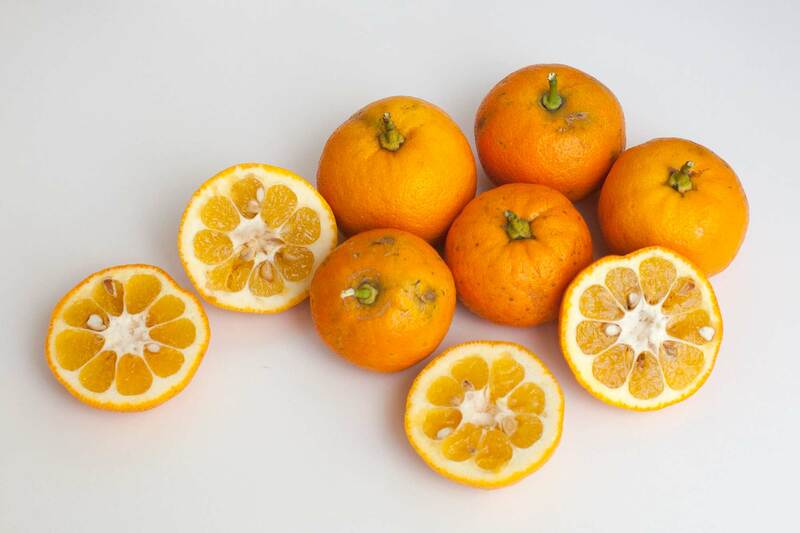 I am far from being a specialist of citrus fruit but in my view they were sour orange varieties, because they tasted bitter. I am not used to sour oranges, as we mainly eat sweet ones in Western Europe, but I must say that after a while I got used to the bitterness and started to like what I perceived as a rather pleasant complexity of aromas. 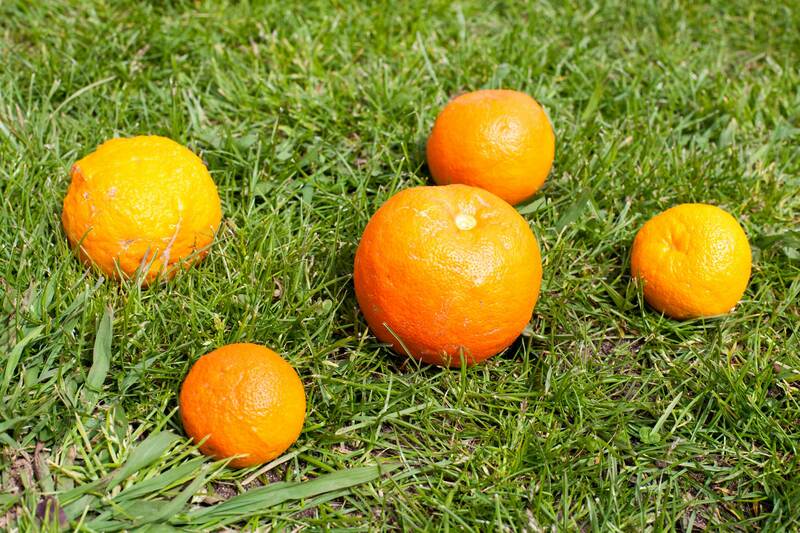 Maybe this bitter orange was more nutritious than its commercially produced sweet counterpart? This would be the last of my citrus fruit experiences in Lisbon. It fell slightly short of my expectations. Tasting fruit in a flat was not as exciting as the discovery of a lemon tree at the corner of a ceramic-tiled historic building in the streets of Lisbon, a conversation with a Portuguese specialist of natural history and science in a historical place like the Palácio da Calheta or the scent of orange blossom on a sunny day in public parks. It also was the end of our trip, which gave this experience a slightly bitter taste. Twenty four hours later, we would say goodbye to magical Lisbon, this city of explorers open to the Atlantic with its rich heritage and wonderfully lively Southern European lifestyles, made even more colourful by the citrus fruit present in its streets and parks. I would still have my books to continue the journey. Map of Lisbon’s main districts: https://www.lisbon.net/neighborhoods (accessed 30 April 2018). Tanto Mar exhibition: http://www.mude.pt/exposicoes/so-much-sea-transatlantic-flows-through-design_80.html (accessed 30 April 2018). An English translation of Bruno Funari’s description of the orange is available here: http://www.corraini.com/en/catalogo/scheda_libro/20/Good-design (accessed 30 April 2018). This entry was posted in Stories and tagged Citrus, Lisbon, Portugal by Les Jardins d'ici. Bookmark the permalink. What a fun post! It’s so enjoyable to explore all aspects of a fruit species, including its history and how it’s been woven into human culture. 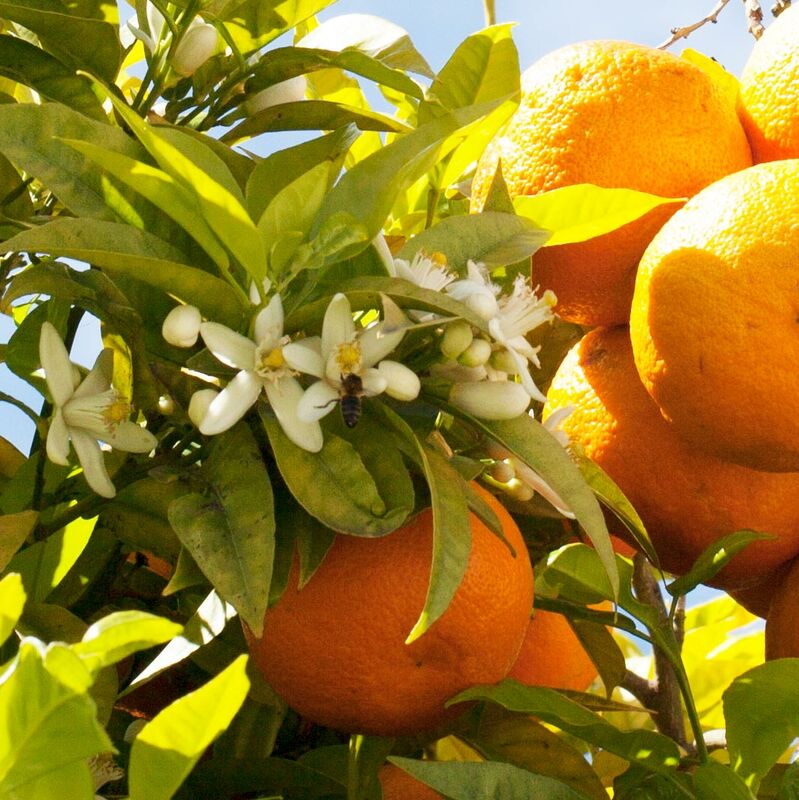 Here in Florida, most citrus species flower in March, and take any where from 7 to 13 months from flowering to fully ripe fruit, depending on variety. 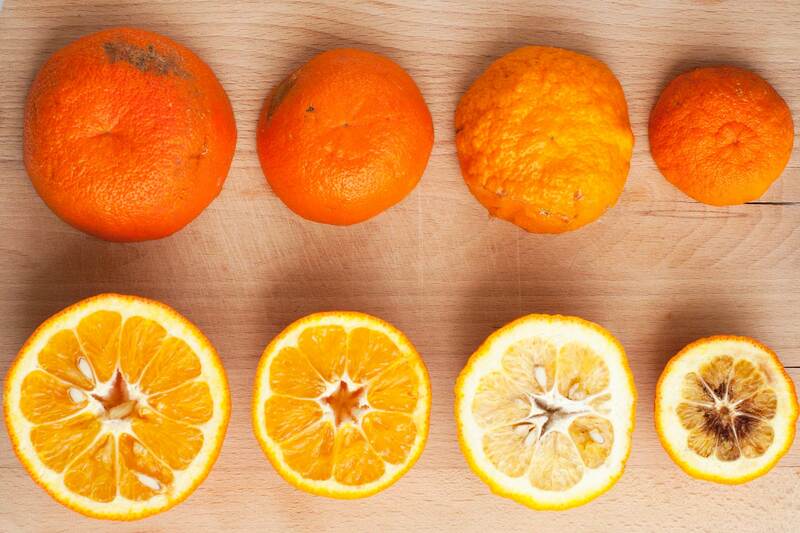 So early mandarins ripen in October, but grapefruits are only just now getting really good and sweet. Thank you Craig, I am glad you enjoyed the story! As far as I understand we broadly have the same seasonality in Southern Europe. I also read this: ‘Generally the Femminello (a lemon cultivar grown in Sicily) can be harvested for eleven months of the year, with the only hiatus falling in August’… ‘It has become standard practice to impose a deliberate drought on a proportion of Feminello trees in a lemon garden in April and to water them again only towards the end of July’ (Helena Attlee, The Land Where Lemons Grow, p 71-72). I understand this enables Sicilian lemon growers to harvest all year long, August included. Merci Catherine ! Je ne savais pas que tu étais une lectrice fidèle. Je viens de revoir ton site de créatrice de bijoux avec grand plaisir. Coucou d’Auvergne, où je suis ces jours-ci.